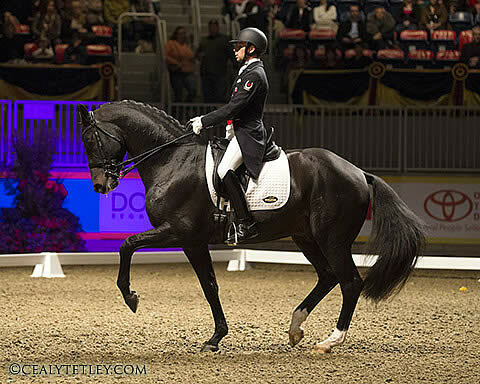 December 10, 2012 – Wellington, Florida – Following a successful fall season, Canadian Olympian David Marcus of Campbellville, ON, currently leads the North American World Cup League standings for dressage. Marcus, 32, won three grand prix tests to dominate CDI-W Dressage at Devon held September 27 to 30 in Devon, Pennsylvania. Coupled with his impressive results in at the CDI-W NEDA Fall Festival in Saugerties, NY, Marcus currently tops the North American World Cup League leader board with Chrevi’s Capital, a 12-year-old Danish Warmblood gelding owned by Deborah Miculinic (nee Kinzinger). The pair has an average score of 70.888% to put them ahead of Melissa Taylor of the United States who is currently ranked second with an average of 70.500%. The top two athletes in the North American League rankings are invited to contest the 2013 FEI World Cup Final from April 24 to 28 in Goteborg, Sweden. Marcus will continue to compete in World Cup qualifying competition throughout the 2013 winter season from his base in Wellington, Florida. He recently received an invitation to compete in the CDI5* World Dressage Masters Palm Beach. Held from January 23 to 26 at the Jim Brandon Equestrian Center, the prestigious World Dressage Masters is a ‘by invitation only’ event that sees the top riders from around the world going head-to-head in both Grand Prix and Grand Prix Freestyle competition. “I’m honoured to be invited to such a prestigious show,” said Marcus. “I’ve been a spectator the past few years, and it’s a show that I’ve always wanted to be competing in, not watching from the sidelines. I am excited to have that opportunity. Marcus will ride his 2012 London Olympic mount, Chrevi’s Capital (Chrevi’s Cavallo x Weinberg), at the World Dressage Masters and has high hopes for a strong finish, given his success at CDI-W Dressage at Devon, which is also held at night in front of a large audience. Marcus is based at Stillpoint Farm in Wellington, FL, for the winter season, having brought 12 horses south from his David Marcus Dressage training facility in Campbellville, ON. In addition to Chrevi’s Capital, Marcus will be campaigning Miculinic’s Don Kontes at the grand prix level, and continuing the development of the six-year-old Dutch Warmblood mare, Betrina. His students, including 2012 North American Young Riders’ Championship individual bronze medalist, Alexandra Reid, will also be competing on the Florida circuit in the Young Riders’, Junior and Adult Amateur divisions. Marcus also has a select few sales horses that have accompanied him to Wellington, Florida.